Co-hosts Gisele Bundchen, left, and Tom Brady attend The Metropolitan Museum of Art's Costume Institute benefit gala celebrating the opening of the Rei Kawakubo/Comme des Garçons: Art of the In-Between exhibition on Monday, May 1, 2017, in New York. So how did Tom Brady and supermodel wife Gisele Bündchen spend the New England Patriots' bye week? Exactly like you'd expect them to. According to their Instagram feeds, Brady and Gisele hit the beach in the Bahamas during the team's week off. 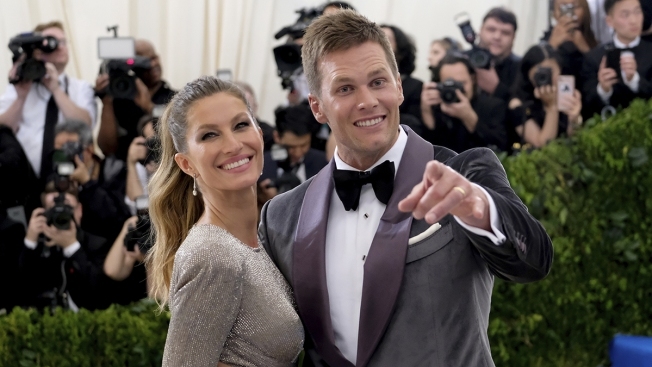 Brady posted one photo showing Gisele sprawled out on the beach in a bikini, with the caption "Sun's out..." and another showing him lying in a hammock at Baker's Bay Ocean & Golf Club with his son, with the caption "Bye-Bye, Bye!" Gisele, meanwhile, posted a photo of Brady planking on the beach, with their son standing on his back. "My boys," read the caption. She posted another photo of herself and a friend in the water at sunset. Brady and the Pats return from their bye this week, and are scheduled to play the Denver Broncos on Sunday Night Football on NBC Boston.